If you have a cracked, broken, weakened, or worn down tooth, then your dentist may be able to restore it quickly and effectively with a custom-made dental crown. Typically, placing a crown requires preparing and measuring your tooth with digital imaging technology, then sending the measurements to a trusted dental lab where a technician will craft the custom crown. After a few days, the lab will return the crown and your dentist can secure it to your tooth during a subsequent visit to the office. At Smith Family Dentistry, we can simplify the process by using innovative CEREC® technology to create lifelike dental crowns in just a single day! CEREC® One Visit dental crowns utilize advanced computer-aided design and computer-aided manufacturing (CAD/CAM) technology. After your dentist determines that a dental crown is the right choice, he will utilize the CAD/CAM technology to record detailed images and measurements of the tooth that needs restoration. 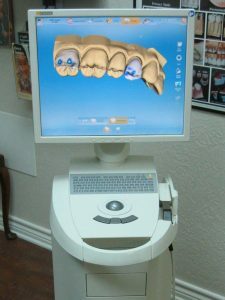 Then, the images will be digitally sent to the CEREC® on-site milling machine, which will shape your custom dental crown from a solid piece of ceramic that has been custom-tinted to match your tooth’s appearance. Rather than waiting several days or more for your crown to be ready, you can enjoy your new smile in just one visit. If your dentist determines that a full dental crown isn’t necessary to restore your tooth, then he may recommend a custom porcelain onlay, instead. An onlay is a more minimally invasive restoration that can be placed over a part of the tooth, typically its chewing surface and one or more sides. Onlays provide direct restoration to the damaged area of a tooth without having to completely modify the tooth to accommodate a dental crown. If you need a dental crown, then we can help you restore your smile in just one day with a CEREC® One Visit crown! To find out if a single day crown is right for you, call Smith Family Dentistry in Greenville, TX, today at 903-455-5750. We proudly serve patients from Hunt County, Greenville, Royce City, Sulphur Springs, and all surrounding communities.